Among the wonders in nature, eggs hold a top place. The mystery of the hatching of an egg cannot be explained by any of the great minds of the world. Many eggs hatch in multiples of seven days. The eggs of a potato bug hatch in seven days; those of a canary in fourteen days. Hen eggs hatch in 21 days and duck eggs in 28 days. One specie of the mallard hatches her eggs in 35 days. The eggs of the parrot hatch in 42 days. Things do not happen by chance in nature. God ordains all the affairs of life, whether it be in the animal kingdom or the vegetable kingdom. 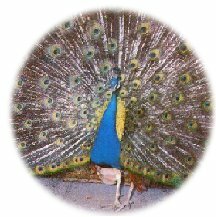 How is it that the beautiful feathers of the peacock on which are accurate markings, come out of an egg which contains only yellow yolk and a white or colorless albumin? How did the colors get there? How is the figure formed on the feathers in such a way that when the tail is spread the markings are perfectly in place and beautiful in appearance? God programmed it that way in the beginning. Only God could do that. Some folks think it all happened by chance over millions and millions of years by gradual change (called evolution). Imagine walking into the woods and finding a wrist watch. Would you say it got there through millions of years of gradual change (evolution) in a pile of dirt? No! You would consider that an intelligent mind designed and put together the watch, and someone left it behind. A universe of such an order and beauty demands an intelligent, all powerful, Master Creator, not by a chance changes. He is the One and Only God. God of the seven universes and all the creatures. The God of Adam, Noah, Abraham, Jesus, Moses, Muhammed and every human being alike. God made the heaven, the earth, the seas, and all that are in them. God made you. God made you that you might know Him, worship Him and enjoy being with Him forever. No one has ever seen God. He is not like us and our eyes cannot see Him, but God put around us millions of things that He created and all of them tell us about His presence. Although we cannot see Him, He is with us all the time and is closer to us than even our own heart. [2:29] He (GOD) is the One who created for you everything on earth, then turned to the sky and perfected seven universes therein, and He is fully aware of all things. [4:1] O people, observe your Lord; the One who created you from one being (Adam), and created from it its mate (Eve), then spread from the two many men and women. You shall regard GOD, by whom you swear, and regard the parents. GOD is watching over you. [6:73] He is the One who created the heavens and the earth, truthfully. Whenever He says, "Be," it is. His word is the absolute truth. All sovereignty* belongs to Him the day the horn is blown. Knower of all secrets and declarations*, He is the Most Wise, the Cognizant*. [7:54] Your Lord is the one GOD, who created the heavens and the earth in six days, then assumed all authority*. The night overtakes the day, as it pursues it persistently, and the sun, the moon, and the stars are committed* to serve by His command. Absolutely, He controls all creation and all commands. Most Exalted is GOD, Lord of the universe. [10:3] Your only Lord is GOD; the One who created the heavens and the earth in six days, then assumed all authority*. He controls all matters. There is no intercessor, except in accordance with His will. Such is GOD your Lord. You shall worship Him. Would you not take heed? [11:7] He is the One who created the heavens and the earth in six days - and His (earthly) domain was completely covered with water - in order to test you, to distinguish those among you who work righteousness. Yet, when you say, "You will be resurrected after death," those who disbelieve would say, "This is clearly witchcraft*." [14:32] GOD is the One who created the heavens and the earth, and He sends down from the sky water to produce all kinds of fruit for your sustenance. He has committed the ships to serve you on the sea in accordance with His command. He has committed the rivers as well to serve you. [ 21:33] And He is the One who created the night and the day, and the sun and the moon; each floating in its own orbit. [ 24:45] And GOD created every living creature from water. Some of them walk on their bellies, some walk on two legs, and some walk on four. GOD creates whatever He wills. GOD is Omnipotent*. [25:54] He is the One who created from water a human being, then made him reproduce through marriage and mating. Your Lord is Omnipotent*. [31:10] He (GOD) created the heavens without pillars that you can see. He established on earth stabilizers (mountains) lest it tumbles with you, and He spread on it all kinds of creatures. We send down from the sky water to grow all kinds of beautiful plants. [ 43:12] He is the One who created all kinds, in pairs (male and female), and He created for you ships and livestock to ride. [64:3] He created the heavens and the earth for a specific purpose, designed you and perfected your design, then to Him is the final destiny. [65:12] GOD created seven universes and the same number of earths. The commands flow among them. This is to let you know that GOD is Omnipotent*, and that GOD is fully aware of all things. [ 67:3] He created seven universes in layers. You do not see any imperfection in the creation by the Most Gracious. Keep looking; do you see any flaw? [23:12-19] We created the human being from a certain kind of mud. Subsequently, we reproduced him from a tiny drop, that is placed into a well protected repository. Then we developed the drop into a hanging (embryo), then developed the hanging (embryo) into a bite-size (fetus), then created the bite-size (fetus) into bones, then covered the bones with flesh. We thus produce a new creature. Most blessed is GOD, the best Creator. Then, later on, you die. Then, on the Day of Resurrection, you will be resurrected. We created above you seven universes in layers, and we are never unaware of a single creature in them. We send down from the sky water, in exact measure, then we store it in the ground. Certainly, we can let it escape. With it, we produce for you orchards of date palms, grapes, all kinds of fruits, and various foods. authority= being in full charge and responsible. committed= made to follow the orders. declarations= what has been made known. Omnipotent= to have unlimited power and influence. persistently= to exist for a long time. sustenance= means of support and maintenance. witchcraft= the use of magic. Who created the animals, the trees, the oceans, the stars, the sun and the moon ? Can gradual change (evolution) change a pile of dirt into a dog, a watch, a car, an aeroplane? From which material did God create Adam ? From iron, from gold, from wood or from mud? How did the beautiful colors of the peacock get there? who put it there? Why does God send water to us from the sky ?